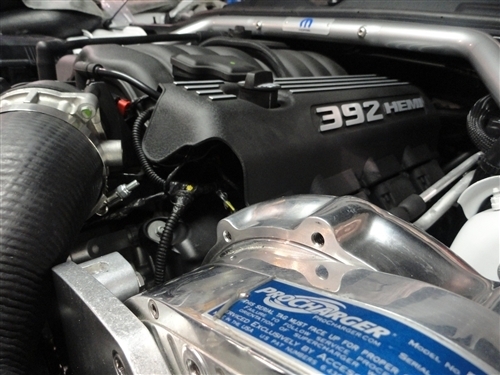 Add 150+ Horsepower to Your 6.4L HEMI 300c! ProCharger is now shipping their tuner supercharger systems for the 6.4L HEMI-equipped SRT-8's. With 7 psi of intercooled boost, the HO Intercooled Systems reliably and safely produce 150+ HP gains on stock engines running pump gas. Featuring the coolest charge air temperatures available, the ProCharger system delivers industry-leading power gains and superior engine longevity. Higher boost and power levels are available for modified engines. Features of the HO Intercooled System includes a 3-core, air-to-air intercooler system, and the patented and proven P-1SC-1 self-contained supercharger with available 3-year warranty. Contact HHP to complete your supercharger parts list. Tuner Kits require the purchase of a fuel system upgrade (injectors), map sensor and custom tuning. If you are running a modified engine, let HHP put together the best kit for your application. With reliability, quality and power far superior to other forced-air induction systems, ProCharger Systems and Tuner Kit are excellent ways to add even more power to these modern HEMI powerhouses. ProCharger supercharger systems for the EFI HEMI engines feature easy installation, minimal relocation of components, no need to punch a hole in the engine oil pan, and avoid having to deal with all the complexity of an air-to-water-to-air intercooler. Higher boost and power levels available for modified engines. Tuner Kits come without injectors, map sensor or tuning. OUR #1 SELLING SUPERCHARGER AT HHP!! !